Your favorite event is back! In March we hosted our inaugural happy hour fundraising event, Beers for Queers at Fogbelt Brewing. It was a great success not to mention, it raised over $500 in support of our youth and community! We had such a good time meeting new people and having fun, we’ve decided to do it again. This time, we’re headed out to Guerneville for a Saturday afternoon wine tasting! 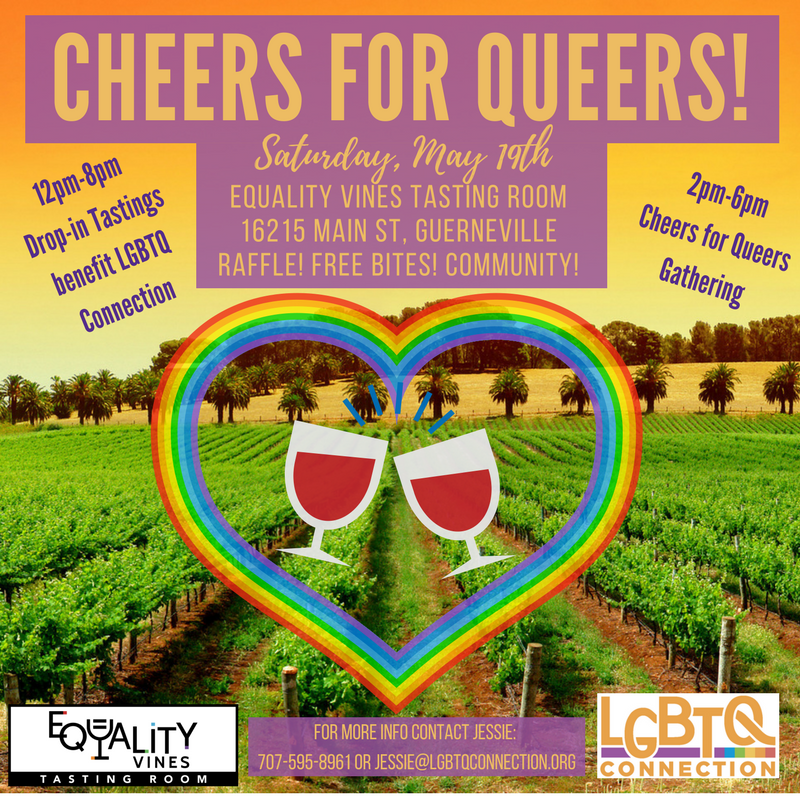 Join us Saturday, May 19th at Equality Vines Tasting Room to learn about this unique winery and sip some wine while supporting LGBTQ Connection. The tasting room will offer two glasses of wine for $6, and a portion of all sales will directly benefit LGBTQ Connection’s youth-led movement building efforts in Sonoma & Napa Counties. The tasting room is open from 12-8 pm, so drop by anytime for a tasting. The Cheers for Queers Gathering will go from 2-6 pm, where we’ll have some tasty snacks, artisan chocolates, an awesome raffle, music, and good times! Can’t wait to see you there! What: Cheers for Queers wine tasting! Why: To celebrate community while supporting LGBTQ Connection!